EPITACIUS and BASILEUS, (First Century), though there is no reliable account of their lives and purported martyrdom, SS. Epitacius and Basileus are widely believed to have been Apostolic Era Bishops and have been venerated from time immemorial. EUPHEBIUS, (Date Unknown), a Bishop of Naples (Italy) of whose life there are no details extant. Various sources place him anywhere from the second to the eighth century. EUTYCHIUS and FLORENTIUS, two sixth century hermits and wonderworkers who successively served as Abbots of a monastery near Norcia in Umbria (Italy). GOBAN GOBHNENA, believed to be the St. Goban mentioned in the Life of St. Laserian (18th April) as Abbot of the monastery of Old-Leighlin, Co. Carlow, Ireland, he resigned his position to live as a hermit at Tascaffin in Co. Limerick, Ireland. Nothing further is known of this saint, including the exact dates of his life. GUIBERTUS, a Frankish noble and soldier who withdrew from the world and lived as a hermit on his estate in Gembloux in Brabant (present-day Belgium). St. Guibertus later formed a monastery on his estate, and in turn gave the lands to the monastery. He retired to the Abbey of St. Gorgonius of Gorze (abbaye Saint-Gorgon de Gorze — Gorze Abbey) near Metz (France), where he lived until his repose 962. MERCURIALIS, though the early records of the Diocese of Forli in Emilia-Romagna (Italy) have long been destroyed leading to questions of the veracity of the extant accounts of its bishops; it is generally accepted that St. Mercurialis was the first Bishop of Forli. He is remembered as a passionate foe of Arianism, and was one of the three to four hundred bishops in attendance at the Council of Rimini in 359. St. Mercurialis reposed circa 406. 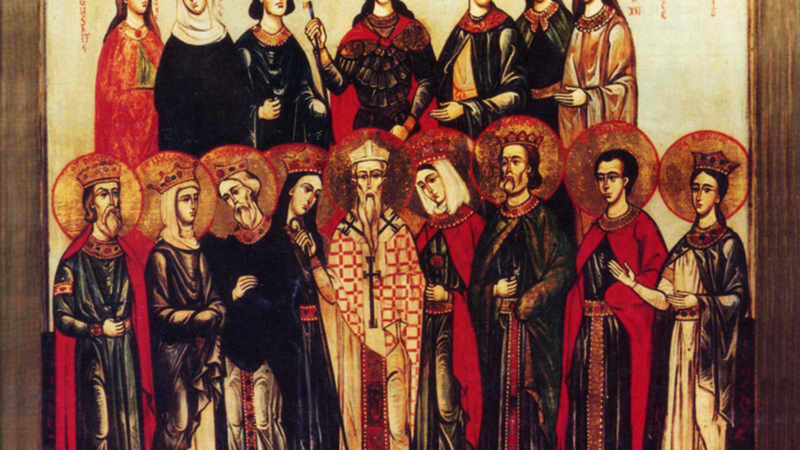 QUINTIAN, LUCIUS, JULIAN, and COMPANIONS, (Date Uncertain), a group of nineteen martyrs in North Africa. According to the Roman Martyrology , they were martyred in the fifth century during the rule of the Arian Gaiseric, King of the Vandals (r. 428–477), however, modern scholars assert this date to be a guess at best. SYAGRIUS (SIACRE), St. Syagrius received monastic tonsure at the Abbey of Our Lady of Lérins (abbaye Notre Dame de Lérins) just off the coast of present-day Cannes, France in the Mediterranean Sea. He spent several years there before founding and serving as first Abbot of the Abbey of Saint Pons of Nice (l'abbaye Saint-Pons de Nice). In 777 he was consecrated Bishop of Nice (France), serving that See until his repose, circa 787.